Pc agent is the PUP that uses misleading techniques to prevent removal. Use Reimage to locate malicious components and get rid of them faster than with uninstall instructions. A full system scan blocks virus reappearance and prevents traffic to malicious domains. PC Agent is a potentially dangerous software which is also categorized as a keylogger. 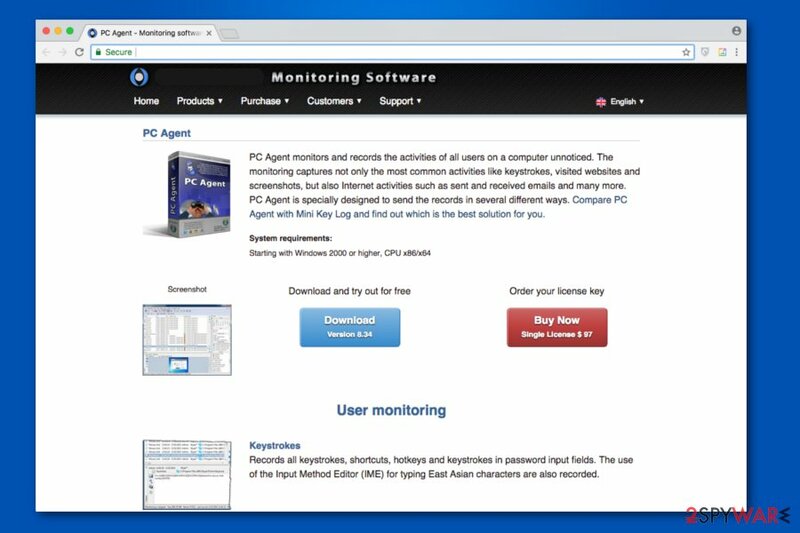 PC Agent is a monitoring software which is designed to record activity on the targeted computer. This program can monitor the activity of the user, computer and the Internet without one's consent. 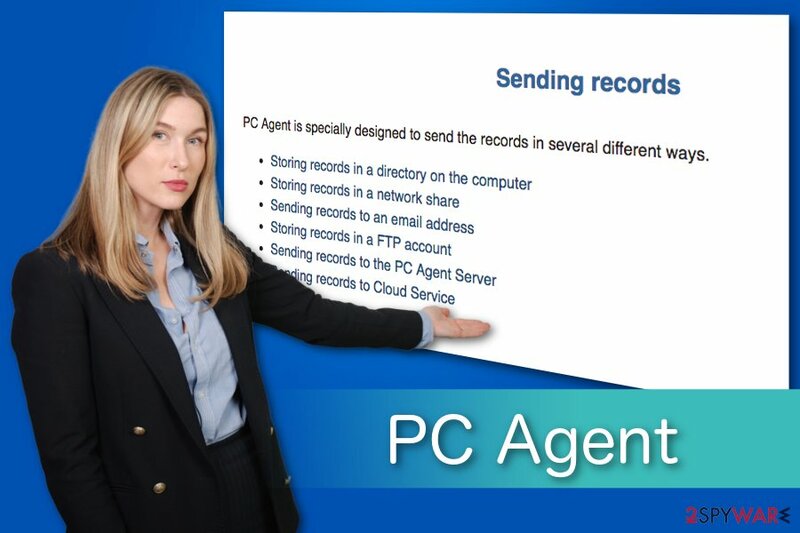 PC Agent can store the collected data in the selected directory, send it to the specific email address or share on the network. Additionally, it is completely invisible in the process list. Thus, criminals might exploit it for malevolent purposes and remain undetected. Even though PC Agent is advertised as a legitimate software which should not be used for illegal activities, there is a substantial risk that cybercriminals might exploit it. Users are advised to stay cautious and do not ignore any suspicious activity on their PC which might indicate PC Agent virus attack. If that is not enough, PC Agent can monitor device as well. In other terms, this unreliable program can check the power state, access files sent to a printer, activate the webcam, track GPS location, and use microphone. Likewise, not only the information about the user's activity is at risk. PC Agent is a monitoring software which can allow to send recorded information from the affected computer. For all the reasons mentioned above, our IT professionals recommend staying cautious. If you have any suspicions that your computer might be infected with this keylogger, you must remove PC Agent immediately. Otherwise, you may encounter privacy-related issues or even identity theft. For PC Agent removal you should install verified security tools to scan your computer. You can use Reimage or another reputable software to run an entire system scan. The antivirus will identify and eliminate all potentially dangerous files from your computer, including PC Agent. Usually, people visit peer-to-peer (P2P) file-sharing sites to obtain paid software for free. In most cases, these websites are dangerous as criminals can upload malicious infections which disguise as legitimate programs. If inexperienced computer users fail to identify the scam, they manually install keyloggers, Trojans, or other malicious applications. Therefore, it is essential to stay away from all unverified websites if you want to avoid cyber threats. Instead, download software only from official pages and use a direct link when it is possible. Additionally, it is wise to use and keep your antivirus up-to-date at all times for protection. As it was previously mentioned, PC Agent removal might be complicated as it is capable of remaining undetectable. Users cannot remove PC Agent manually as its files are not listed in the operating processes or other familiar locations. Thus, only professional help might terminate this cyber threat. You can get rid of PC Agent by installing an antivirus. If it is robust enough, the scanning procedure should take only several minutes before the security program will start virus elimination. Researchers have listed multiple security tools below to help you uninstall PC Agent. Here, look for Pc agent or any other recently installed suspicious programs. ^ Global Positioning System. Wikipedia. The Free Encyclopedia. ^ Margaret Rouse. keylogger (keystroke logger or system monitor). TechTarget. SearchSecurity. This entry was posted on 2018-08-01 at 07:02 and is filed under Keyloggers, Viruses. You can quickly scan the QR code with your mobile device and have Pc agent manual removal instructions right in your pocket. How did you remove Pc agent?